A parent of a child with autism doesn’t focus on those things. They just focus on the moment — whether their child is saying a word, pointing a finger, making eye contact, taking off their shoes, playing with other children, smiling or crying at the appropriate moment, playing productively with a toy, being integrated, going outside of their schedule or norm, feeding themselves, personal hygiene, etc…. just being happy, healthy, and having as close to a normal life as possible. So when the honor roll comes, graduating high school or college happens, or an award or achievement is ever accomplished, we won’t just be proud, we’ll be over-the-moon, because we know that life is an absolute miracle and so are our children with autism. We will also have proof that with love, care, and faith, anything is possible. “You’re doing a great job! I see you even if no one else does. You’re good enough, so is your child. You don’t need another person to recommend one more thing for your child. You know exactly what your child needs intuitively. Don’t give up. You’ve got this; you’re not alone. It does get better. Autism does not have to be a life label. Our children are simply incredible, and so are WE!!! 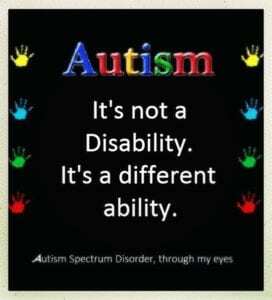 • Our children with ASD are not just their disability. They each have a unique soul and gift. They have a way of looking at the world from a different lens. Their minds are exquisite. If anything, they are changing our world for the better, because they are ONLY pure LOVE and compassion. Don’t underestimate their ABILITY.